What is this odd object in Saturn’s rings? 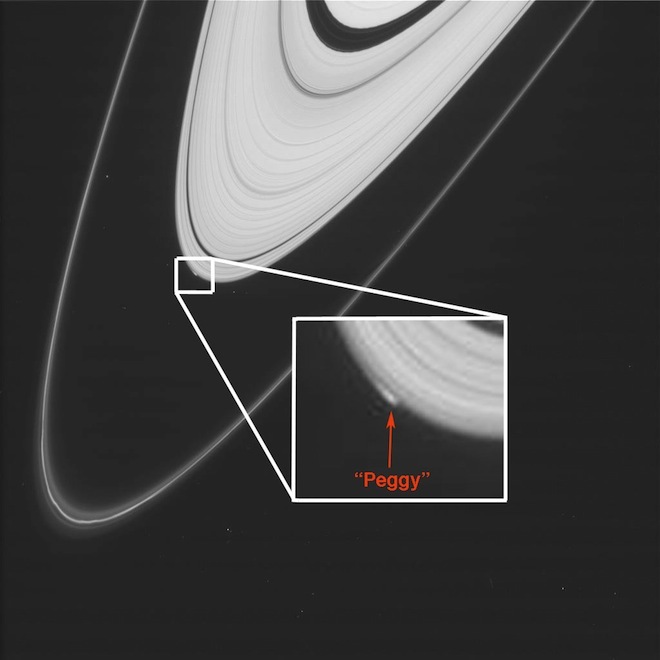 Saturn’s rings are one of the most phenomenal things ever seen in nature, and now there is a new puzzling little mystery in them called Peggy that scientists are trying to figure out. Read MoreWhat is this odd object in Saturn’s rings? 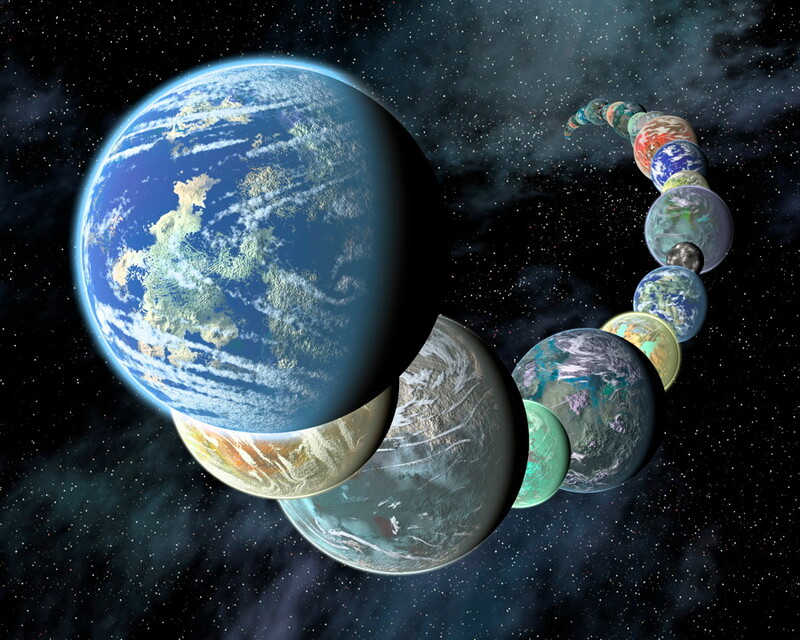 The solar system is full of many planets and moons, each with their own unique characteristics and features, some of which have never been seen anywhere else. 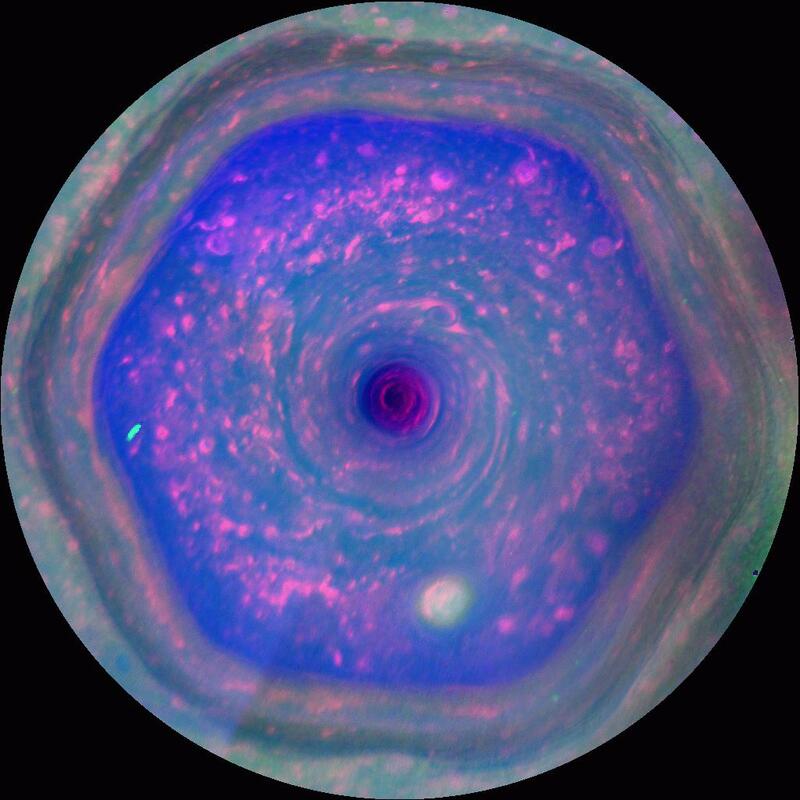 One such oddity is found on Saturn – a giant hexagon-shaped jet stream surrounding the planet’s north pole. It is a natural feature in Saturn’s atmosphere, although the near-perfect six-sided formation might make you look twice. Now, the Cassini spacecraft has taken the best-ever images of this hexagon, it was announced yesterday. Stunning new image from Cassini of Saturn – and Mars, Earth and Venus too! The Cassini spacecraft has taken another stunning new panoramic image, released yesterday, showing Saturn and its rings in all of their glory. It has done this before, including ones showing the Earth and Moon in the far distance, as tiny specks of light. But this new image is even better; not only does it again show Saturn and its rings beautifully backlit against the Sun in natural color, but this one also shows Mars and Venus, as well as the Earth and Moon! Read MoreStunning new image from Cassini of Saturn – and Mars, Earth and Venus too! 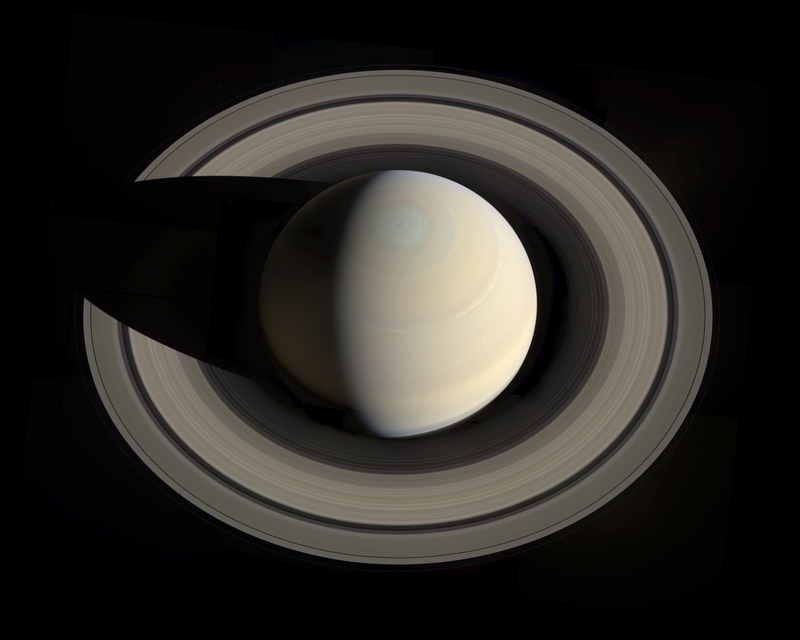 Saturn as seen from above by the Cassini spacecraft. Click image for larger version. This stunning view of Saturn is one that can never be seen from Earth; it was taken by the Cassini spacecraft, still orbiting the huge ringed planet, from high above the equatorial plane on October 10, 2013. Only in such a view can the planet itself be seen as separate from the surrounding rings. This composite image was made from 36 individual images. Beautiful! Last Friday, a remarkable thing happened, which received a lot of publicity, especially for space fans: the Earth had its photo taken – from Saturn! 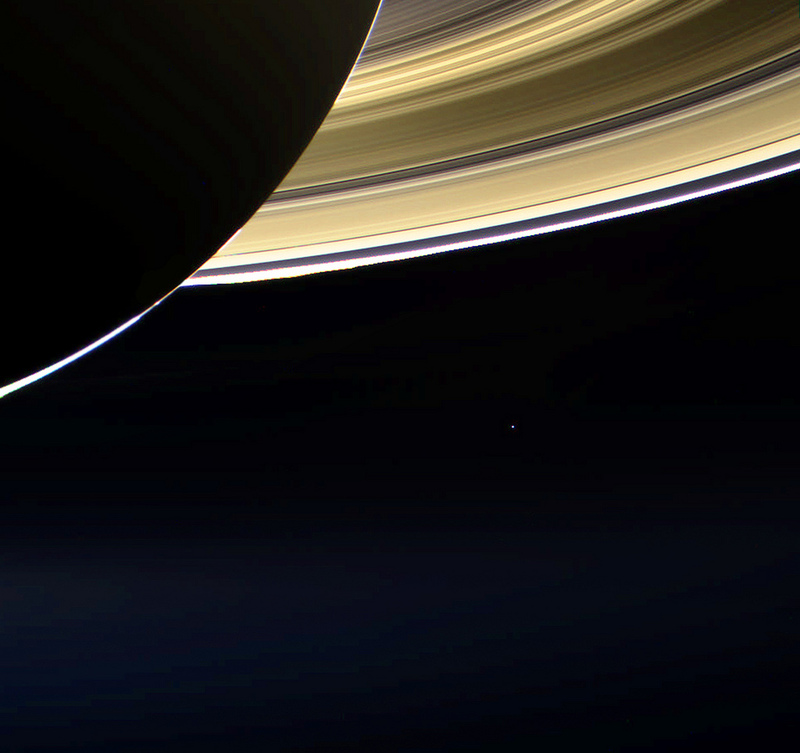 The Cassini spacecraft took the images, which were used for The Day the Earth Smiled event, showing the Earth as a very tiny blue speck in the distance, with Saturn and its rings looming in the foreground. Zooming in closer, the Moon can also be seen. How cool is that? But that’s not all… although it didn’t seem to get as much attention, the Earth and Moon also had their picture taken from Mercury, by the MESSENGER spacecraft, on the same day! Something remarkable is going to happen next Friday, July 19, 2013. On that day, the Earth is going to have its picture taken, but not just from an orbiting satellite, from Saturn. The Cassini spacecraft, still orbiting the ringed planet, will take images of Saturn and all of its rings during an eclipse of the Sun. This has been done twice before, but this time, the view will include another tiny, far-away blue speck – the Earth, in natural colour.